A world first for Shoreditch and shopping? TO ITS promoter, Boxpark is “the world’s first-ever pop-up mall”. To multinationals, it is a chance to cash in on “the Olympics 2012 effect”, as they term the expected jetloads of affluent visitors. To others, it may seem the start of the end of creative Shoreditch, the final assault on the district by corporatism, just as the City captured the 1876-founded Spitalfields market a kilometer south, rebranding it, with unintentional irony, Old Spitalfields Market. 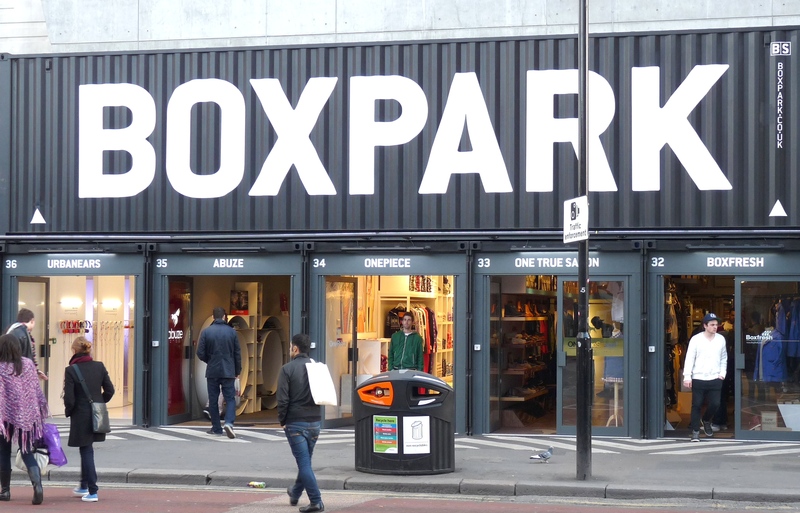 Boxpark will be a cluster of shipping containers arranged as a shopping centre next to Shoreditch High Street station and due to open in this summer. The 4.7-hectare (11.6-acre) site is owned by Hammerson, the huge property company that wanted to demolish the Light building 100m to the south. With Ballymore Group, Hammerson intends to develop the site in five years’ time; meanwhile the prime land has been lying unused. Roger Wade, a former market trader who now runs fashion brand consultancy Brand Incorporated, came up with the idea of a retail centre that can be picked up and moved when the really big money wants the site or if it turns out to be unsuitable — unlikely, given its location next to the station and within sight of Shoreditch Houses’s rooftop swimming pool. Wade, who is also a lecturer at London College of Fashion, said that his “innovative, low-cost, low-risk retail” scheme is targeting Carhartt, stussy, Fred Perry, APC, Nigel Cabourn, Heritage Research, Nudie and Religion; high-status brands all. Retail sources have told Loving Dalston that most of the 60 containers are let ahead of the scheduled August opening. Jonathan Baker, a London College of Fashion senior lecturer in fashion retail branding and visual merchandising, has doubts. “Boxpark is an interesting concept,” he says, “although it’s clearly just an opportunity to provide yet another entry point for the national and global multiples to move ever closer to us.